The English have a certain way of doing things. And like most things English, their loudspeakers have a certain style or way about them. For some, it's not their cup of tea, and for others it is the epitome of perfection, not to mention sophistication. I fall (somewhat) into the latter camp, as I've always appreciated and found myself drawn to that "British" sound. Despite my love for many British-born audio companies, though, I've never once owned or personally spent time with the brand responsible for the speakers featured in this review, Monitor Audio. Monitor Audio has been a staple in the audiophile and home theater loudspeaker space for over 40 years. I know this because I, like you, have Google and, well, it told me. The Monitor Audio Silver 300 reviewed here are relatively new as far as loudspeakers go, bowing sometime in 2017, just in time to garner a few best-of awards. The Silver 300 came to my attention shortly after CEDIA 2018, however, when Home Theater Review owner and publisher, Jerry Del Colliano, texted me a picture of the 300s in white with the simple request: "interested?" My first impression was that the Silver 300s looked gorgeous, though I anticipated those good looks to come at a price. I replied, "maybe...how much?" "Under two grand a pair!" he replied. I was beyond intrigued, since I was bracing myself for a price tag of about $5,000/pair given how the Silver 300s appeared in Jerry's less than fantastic smartphone pic. A month or so went by before a pair of Silver 300s in Satin White arrived at my door, along with a matching center and subwoofer. Before I jump too far ahead and start talking about my specific setup of the Silver 300 speakers, let me go over some of the nitty gritty. The Silver 300 retails for $999.99 each, or $1,999.98 a pair. The speaker comes in a variety of finishes, including black oak, walnut, rosenut, natural oak, piano gloss black, and satin white. Truth is, the speaker looks utterly fantastic in any of its finishes, but I asked for satin white because it best suited my decor. The Silver 300 is a moderately large floorstanding loudspeaker that isn't too wide, measuring nearly 41 inches tall by roughly seven inches across and 14 or so inches deep. If you add its included outrigger feet into the equation (you should) then the total width of the Silver 300's footprint is nearly 10 inches. The speakers aren't too heavy, but heavy enough to not feel cheap at 44 pounds apiece. Speaking of cheap, the Silver 300 speakers are designed by Monitor Audio in England, however they're manufactured in China, though you'd never (really) know it, as they are among the most beautiful and masterfully crafted cabinets I've ever seen come out of China. What makes the Silver 300 so striking is its minimal or modern aesthetic, further enhanced by the absence of seams and/or hardware. Truly, all of the edges, top to bottom, front to back, and side to side are radiused with nary a visible seam in the finish. Moreover, when you eye the speaker's four drivers, no hardware is visible, making one wonder just how are they're affixed, since the Silver 300 doesn't use metal rings or decorative trim around its woofers to hide such hardware. Instead, you're treated to two six-inch, flush mount bass drivers accented by a single, four-inch midrange driver that's capped off by a one-inch gold dome tweeter. Admittedly the mid-range driver and gold dome tweeter are housed in a decorative aluminum surround--though it too lacks any visible hardware. While the Silver 300 may have four drivers, it is a three-way design, with a reported frequency response of 32Hz to 35kHz and a nominal impedance of 8 Ohms, with a rated sensitivity of 90dB. These figures make the Silver 300 pretty much good to go with a wide variety of components, including most every modest to high-end AV receiver on the market today. Monitor Audio states that the Silver 300 will perform its best powered by an amplifier (or receiver) with 80 to 200 Watts on tap. It's worth noting, though, that the Silver 300's minimum impedance of a little under 4 Ohms may give some lesser or less expensive AV receivers a work out under stressful or spirited listening (more on this in a moment). The Silver 300 comes with magnetic grills as standard and four user-attachable outrigger feet that feature flat floor pads or spikes to better ground the speaker itself. 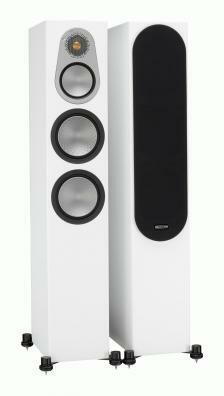 Around back, you'll find two smaller ports, making the Silver 300 a bass reflex cabinet design. It is also bi-wireable, as it features two pairs of five-way binding posts that can accept all types of speaker wire from bare to spade adapted. Like I said earlier, the Silver 300s arrived shortly after CEDIA, along with a matching center, the Silver C350 ($874.99), and a Silver W-12 subwoofer ($1,649.99), all in Monitor Audio's striking Satin White finish. Unboxing the Silver 300s was easy enough, as the best way to tackle said undertaking was printed clearly right on the top of the box. The Silver 300s were neatly and competently packaged, which is to say they arrived safe and damage-free, two things that don't always go together when talking about loudspeakers making the trek from China. The only real tedious part to the Silver 300s' installation was affixing the included outrigger feet, of which there are four per speaker, each requiring two different types of screws (oh, China). Once I had the feet installed (all eight of 'em), I placed a Silver 300 on either side of my low-slung entertainment center, which put the speakers roughly seven feet apart (tweeter to tweeter) with about 18 or so inches between the back of the speakers themselves and my front wall. I placed the C350 atop my entertainment center, directly below my reference OLED UltraHD display, the LG C8. As for the W-12 subwoofer, I integrated that a week or so later, since I really wanted to get a feel for how the Silver 300s performed on their own as a largely stereo pair. Eventually, the subwoofer would find its home to the right of the right speaker along my front wall. The speakers were driven by a host of electronics, ranging from tubes to solid state, but the bulk of the listening was done via my Marantz NR1509 AV receiver , with the left and right main speakers being powered (via the Marantz's stereo preamp outputs) by a Crown XLS 1002 DriveCore 2 Series amplifier, which is good for 215 Watts per channel at 8 Ohms and 350 Watts at 4. The center channel was powered by my Marantz receiver, and I used the receiver's internal setup menus, specifically the speaker level adjustments, to properly balance their levels so that the front three speakers matched in terms of SPL regardless of what was being used to drive them. Source components included my DuneHD Blu-ray player/media streamer, a Roku Ultra, and a U-Turn Audio Orbit Plus turntable in conjunction with a Kaskode One phono preamplifier from Austin-based Band-width Audio (review pending). I subbed in Band-width Audio's 288 Monaural tube amplifiers for some of my listening tests, which I'll call out later in this review. Everything was wired using interconnects and whatnot from Monoprice.com, and the speaker cables were a mashup of some old The Wave speaker cables from Transparent that I still have banging around in my system. While I don't believe in break-in or any of that nonsense, I didn't get a chance to sit down and critically listen to the new Silver 300 speakers for a few days due to scheduling conflicts.